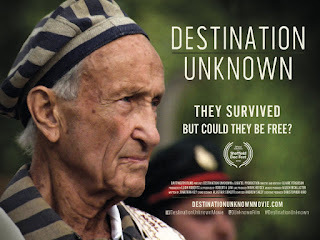 Destination Unknown, directed and edited by Claire Ferguson, navigates the Holocaust through the memories of twelve people who lived through it in different ways. To name a few, there’s Helen Sternlicht who was saved by Oskar Schindler. Stanley Glogover survived Auschwitz. Mietek Pemper was Oskar Schindler’s closest assistant. Frank Blaichman left his family to be a partisan fighter. Eli Zborowski tells the story of how he survived by hiding behind a wall in a cellar. All twelve of the stories told have a specificity to them that widens the scope of the Holocaust to a human level and allows us a gateway into understanding it in in a personal way. The Holocaust is a horrifying event that’s almost too unimaginable to perceive. The filmmakers take us behind the curtain and into the human stories that made up the event. It’s at once both an informative documentary and a diary full of personal stories. Destination Unknown largely takes the shape of a talking heads documentary, a form that can become repetitive if the execution and subject matter isn’t delivered with precision. Ferguson sidesteps this by making it a quick 78-minute passage of these twelve people’s lives. Most of their stories would benefit with some breathing room. Similarly, much of the quickly spliced B-roll (Photographs, Newsreel footage, the subjects walking) has a historical beauty and slowing the pace to let the history sink in would’ve given the personal stories a mythos and more emotional weight. The aesthetic has a home video quality that works well the intimate aspect of the film. As viewers, we’re being let into their homes and lives and experiencing their memories. The quick pace doesn’t quite allow the film to linger in the spaces, memories, and homes of these individuals. Without the context of their personalized space, their stories feel more like we’re eavesdropping on a stranger than meeting someone and slowly learning about their most intimate stories. Where the film succeeds is in its close ups of these twelve people whose pasts contain terrible horrors and sadness, but also bravery. That they can even retell these stories has a powerful quality that makes you lean in. Their expressions and body language in the B-roll and their retellings of events help us to understand their stories in a way that words can’t convey. Destination Unknown may be a too-quick investigation into the human side of the holocaust, but it’s one full of value and importance. Many Holocaust films -- both narrative and documentary –- explore it as an extension of the war or in a past tense -- as if it’s now just a piece of history. Ferguson takes us up close and into the current lives of people who are still affected by the Holocaust. It’s a sad and unforgettable moment in history that still creates an uncertainty in people’s futures. Destination Unknown shows how people persevere in the face of horror, both in the past and future.